Zhuge Liang (181-234) was a military marquis and statesman of the Three Kingdoms period. During his stay in Nanyang, he lived in a thatched hut, where Uu Bei visited thrice in succession. 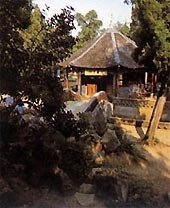 A memorial temple was built near the ruins of the thatched hut.